I'll leave it to you to make up your own mind. Was it a colossal fail, an attempt at humor gone awry, or a case of an overly-sensitive blogging community? Besides, who cares? It's still a fun book that is generating a lot of press (and sales, one would hope). I'm sure it will lead to a new kind of book for a while. And that's never a bad thing. I've been reading about this book, and might have to check it out. 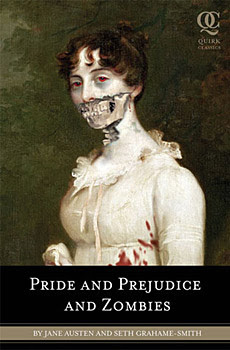 Although I've never read Jane Austen. So we'll see. I think that the publisher just made a bad choice. I think that she was trying to be funny or joke around, but that kind of stuff doesn't come off well in a letter or e-mail when the people don't really know you or what your normal tone is. I actually kind of feel sorry for her because I think she probably felt really dumb.